Including the universe we live in, there are 22 parallel universes each one of them is independent from the others. Although quantum physicists are still theorizing about this topic, they will find the answer in the future when new discoveries and hypothesis on quantum physics be developed. Hopefully one of them will do the math and reveal the existence of these 22 parallel universes. Someday, humanity will achieve the techonology to travel to those universes because the key lies on quantum physics. Tar: The physical universe is the manifestation of the Absolute, but so are all the spiritual planes. The Absolute is “Everything” and that includes the 22 parallel universes, which are also His manifestation. I don’t know whether there is anything outside the 22 parallel universes. Interlocutor: Talking about parallel universes, does this mean that if I, here, in this incarnation, have a failure in another parallel universe can I succeed in the same way where here I failed? Interlocutor: And everything happens at the same time? Tar: Of course, it happens at the same time! Interlocutor: There's always a reason for everything. What is the reason for having 22 parallel universes and not 25 or 2 or one thousand? Is it random? Eon: No, no, nothing in the universe is random… I have already said that the universe was created in the simplest possible way. Since there are eleven dimensional possibilities, mathematically there are 22 possible parallel universes. Otherwise, the universe in general would be unstable. That amount is the limit for not making it unstable. This is the answer. Interlocutor: It was said that there are 22 parallel universes as a balancing factor of the Creation. Is it also a factor in balancing the need to have in each of the 22 parallel universes the same amount of Elohim, Divine Energy, Angels, spirits, etc.? Eon: Yes. In the same way that due to gravity, planets are almost spherical. Interlocutor: Well, that was very interesting… Another question, we know that there are 22 parallel universes, but is it because, as you said, for a matter of balance of the Creation? Eon: I confirm to you that it is for a question of balance, as well as the eleven dimensions. 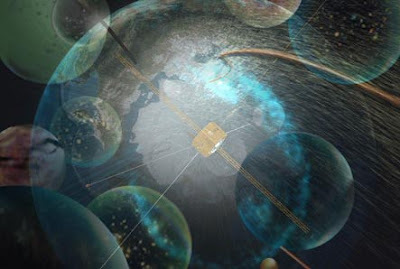 Interlocutor: If there were 23 parallel worlds and 12 dimensions in the creation, would it collapse? Eon: That's right, because there is an order involved… another universe could be created with other form of lives and other parameters, but not this one. Interlocutor: In all the worlds created, even in the 22 parallel universes, are two beings needed to engender a child? I wonder if in any world, for example, three people are needed to procreate. Eon: They are always two, never three, and also only one can procreate. Interlocutor: To conclude and taking into account the 22 parallel universes, what would be the most advanced technological invention in this Big Bang – Big Crunch? Eon: Going to parallel worlds… my bright light of Love for everyone. This entry was posted at Wednesday, August 05, 2009 and is filed under Cosmology, Paradigms . You can follow any responses to this entry through the .